Just by looking at the Compaq nx6125, you know exactly who HP is targeting, clothed as it is in its corporate dark grey skin. But before you dismiss it as just another boring business laptop, it does have a few pleasant surprises in store. The first is the price - just £700 including VAT - and then there's the fact that it's thin and light and comes with a fingerprint reader for added security. Helping to keep the price down is HP's choice of processor. Inside the Compaq nx6125 you will find not the usual Intel CPU, but instead one of AMD's Turion64 processors, in this case an ML-32. Rated at 1.8GHz, the ML-32 is draws 35W of power, so helping conserve battery life, and is backed by 512MB of memory which is fast becoming the standard amount on business notebooks. 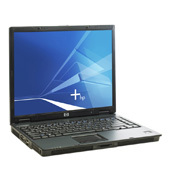 The HP Compaq nx6125 is a business-oriented notebook using AMD’s Turion 64 processor. It’s the only machine to use an ML-32 version, which runs at 1.8GHz. There’s not much difference between ML and MT processors, apart from the wattage; MLs are rated at 35w, while the MT uses 25w. Like the other notebooks in this group test, the nx6125 has no dedicated graphics chip. Instead it uses ATI’s Radeon Xpress 200M chipset, which scored 512 in 3Dmark and 11.21fps in Far Cry, better than most, and impressive considering the target market. There is 512MB of Ram to play with, which may sound stingy when compared to the Elonex, but what the HP lacks in Ram it makes up for in other areas. The HP Compaq nx6125 is a business-oriented notebook using AMD’s Turion 64 processor. It’s the only machine to use an ML-32 version, which runs at 1.8GHz. There’s not much difference between ML and MT processors, apart from the wattage; MLs are rated at 35w, while the MT uses 25w. Like the other notebooks in this group test, the nx6125 has no dedicated graphics chip. Instead it uses ATI’s Radeon Xpress 200M chipset, which scored 512 in 3Dmark and 11.21fps in Far Cry, better than most, and impressive considering the target market. ML-30: » Further information can be found in our Comparison of Mobile Processsors.